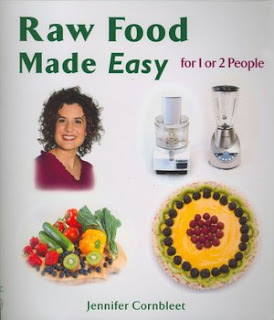 When going through my library for great health books to recommend, Raw Food Made Easy for 1 or 2 people, by Jennifer Cornbleet is on the top of the list. Not preachy and over the top telling you that you must only eat raw food. Eating raw food is important. Generally, most people need to get more raw food into their diet. However, eating raw food should not be turned into a cult. Unlike some other raw food books, this doesn't do that. The recipes are easy to make. Many raw food books have rather time consuming recipes. This book truly is raw food made easy and will not just sit on the bookcase unused, because the recipes are too time consuming. Lots of expensive, raw food "cooking" equipment is not needed. A food processor with S blade and blender will be helpful. But you will not find the majority of recipes demanding you first go out and spend hundreds on fancy juicers and dehydrators. Any negatives with this book? None. This is a great book to help busy people incorporate more health, raw foods into their diet.